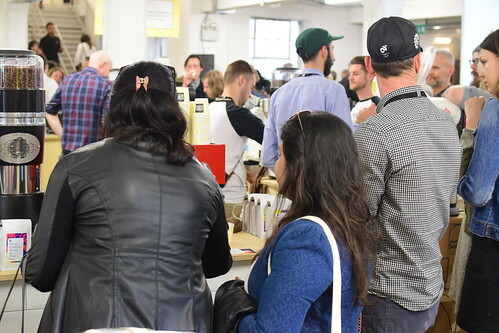 With over 30,000 in attendance both this and last year London Coffee Festival appears to be growing year on year, which is pretty reassuring given that half of the ticket sales go to Project Waterfall. Having covered the previous two years worth of events here on the blog, I took a gamble and applied for a press pass for this years’ event, with the hope of gaining a bit more flexibility to browse the festival at leisure and take a bit more time to seek out some of the more unfamiliar – to me at least – exhibitors around the building. 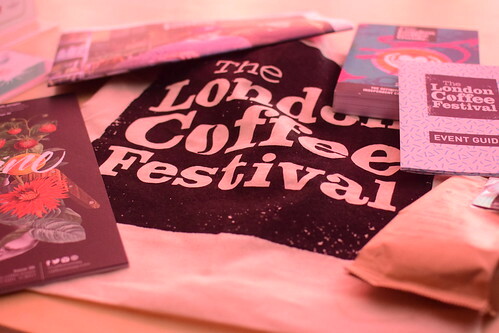 Having been successful in my application it allowed me to pick and choose which day to go down and so this year I thought I’d try out one of the industry days and headed down on the Friday, in the hope of landing on a slightly quieter day, although I’m not entirely sure there are any ‘quieter’ days at London Coffee Festival anymore. Arriving early on the Friday I picked up a guide map finding to my surprise that only the major stands were accounted for, which meant I was going to have to find out where everyone else was for myself, thankfully not an issue though as I had plenty of time to find them. Although this did mean that I spent most of the first hour having a slow wander around to find out where everything was, rather than guzzling down any and all coffee in sight. 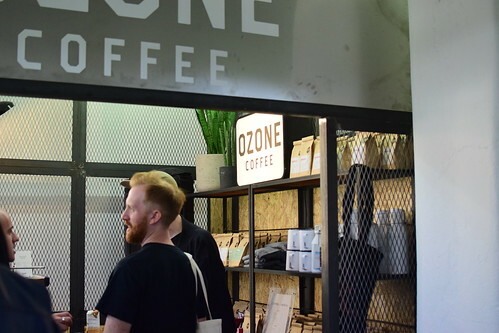 After my initial browsing I found myself beginning my coffee odyssey with Ozone Coffee Roasters, tucked away in the top right hand corner of the Shoreditch zone. Alright, so Ozone are pretty familiar to me, but with the Shoreditch zone mainly full of ice cream, tea and cakes I thought I’d tick them off the list before I headed to some more roaster heavy areas of the festival. Stopping by, they were showcasing a coffee from Burundi, their Munyinya Hill, available in both a washed and naturally processed version. With the brewed coffees now cooled a little the difference between them was particularly discernible, if anything they were an archetypal display of the differences between the two processes. Both coffees featured the same varietals, Heirloom Bourbon with natural Jackson hybrid, with the washed displaying stonefruit and citric qualities on the lighter side of the spectrum and the natural presenting more obvious cherries with a fuller body on the darker redder side of the spectrum. Both enjoyable, both quality displays of flavour, both fairly archetypal, but my slight preference lay with the natural, due to my preference for redder flavours. More about these preferences of mine later, but a good place to start. 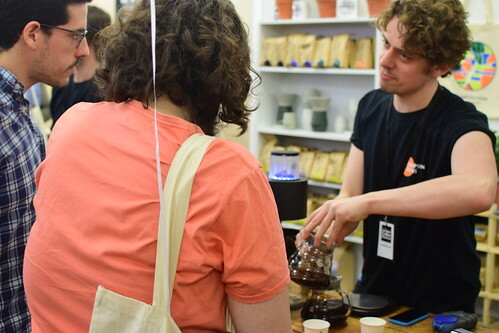 After visiting Ozone and on first appearances – I was still discovering where all the exhibitors were located – I was struggling a little to find a great brewed coffee to sink my tastebuds into, that was until I came across Climpson & Sons. Again a roaster I’m familiar with, but it would have been silly to pass up the opportunity to try their Cerro Azul geisha. 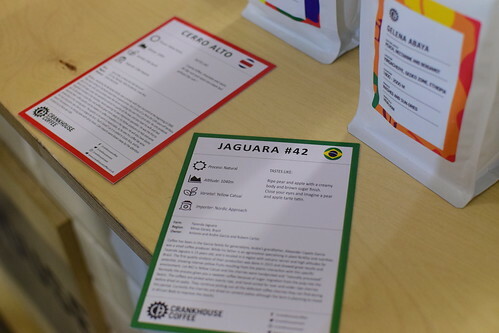 I’ve tried a number of coffees from Cafe Granja La Esperanza now and they’ve all been outstanding, for me they’re synonymous with quality and so it was a pleasure to see their Colombian geisha from the Cerro Azul farm here on Climpson’s stand. Freshly brewed, I took a cup of their – notably pink unicorn stickered – roast of the Cerro Azul washed geisha. My previous experience with this coffee is one of jasmin florals, clean and clear flavours with the natural presenting itself with cherry flavours and the washed leaning more towards peaches. 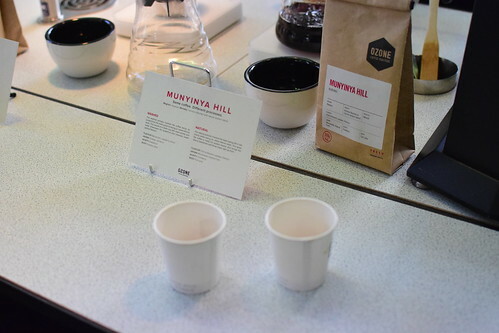 This washed variety from Climpsons’ seemed to fall somewhere between the two, with bolder yellow fruit tones, hints of cherry with a slight effervescence and sweeter more honeyed florals, which gave the cup a body that falls somewhere between a washed and a natural. I didn’t need a second opportunity to know I’d want a bag and so I purchased one of the retail bags without hesitation. A wonderful coffee from a reliably great roaster. I don’t batch brew much coffee myself – I hear there’s an almost arcane art to it – as I’m usually brewing somewhere in the region of 1-4 cups, but I’m well aware of Fetco brewers from a number of cafes filling the price gap between americanos and hand brewed coffees. 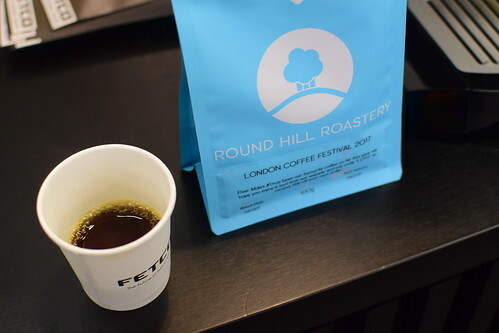 For those who get the brewing process right, batch filter can taste great and I’ve had plenty of great cups before, passing their stand they had Round Hill Roastery’s London Coffee Festival coffee on and so I poured myself a cup to try. Taking a few sips and looking over the bag, I realised this was a coffee I’d already tried earlier this year in its original guise as the Elver Males from Colombia. Reminiscent malic acidity and complex dark sugar notes, brewed noticeably well on the Fetco brewers, no workmen, blame or tools here. 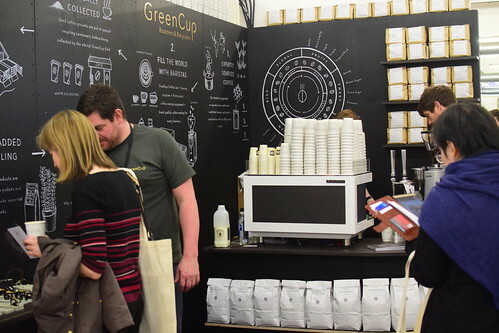 Still in search of some more filter coffee to whet my appetite, I couldn’t help but be drawn in by Green Cup’s stand, where they were offering espresso based beverages, but that hadn’t been what had peaked my immediate interest. Having begun using our spent coffee grounds on the balcony garden outside my kitchen, in an attempt to make better use of my coffee brewing waste, I was intrigued to find out if there were any lessons to be learned from someone doing this in a much more professional capacity. Chatting to the team at Green Cup, they explained how they roast and supply espresso to businesses first and foremost, following this with a collection of all spent coffee grounds and using them to create materials like the panels on their espresso machine or the bar on which it stood, as well as turning it into fertiliser. It turns out as with most things in life it’s all in the balance, spent coffee grounds in moderation can be great for your plants, especially the acidic soil loving ones, but too much and it’ll do more harm than good. With the amount we drink, we’ll just have to grow some more vegetables I guess. 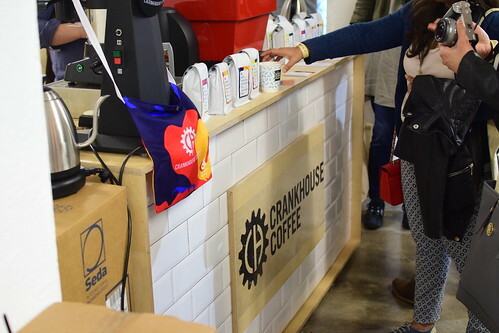 Finally on to the unfamiliar, Crankhouse Coffee were new to me and I was excited to see what they had to offer. Based in Exeter – firmly Origin Coffee heartland – Crankhouse are a dedicated roaster who began life in 2014, although it’s taken a few years for them to cross my path. Having a look over their coffees I couldn’t help noticing one from Nordic Approach, another from Cafe Imports and a third from Schluter. No brand loyalty to green bean importers here! Interested by the natural Brazil from Nordic Approach, I asked them for a cup while questioning them about their approach to sourcing beans for roasting. As a smaller roaster Crankhouse tend to buy smaller lots of green coffee, something which allows them to stay very seasonal in their offerings and keep the quality of their green coffee high. Roasting small amounts of coffee like this means the green coffee isn’t sat around in the roastery deteriorating over the course of its lifespan, but rather is roasted and a new seasonal lot bought in to replace it after around a month. This style of sourcing means you’ve got to nail down your roasts pretty quickly as there’s less room for error on smaller lots, but it keeps things fresh and you’ll gain more experience in the variance of coffee and roasting much quicker. Not mention that its more exciting for your customers who regularly get to try new lots and end up drinking seasonally rather than reaching for that same origin everytime because they know for sure it’s one they’ll like. I’ve seen this kind of approach to coffee roasting before, it was in Oslo, where a lot of the coffee roasters rotate seasonal crops, keeping their green coffee quality high and their offerings to customers freshly updated. It’s just the way that things are done there and we talked about this at length, along with Norwegian coffee culture in general while I sipped on their Jaguara #42. A natural Brazilian yellow catuai variety, which tasted more like a washed El Salvador, with delicate white fruit notes and only the brown sugar notes reminding me that this was indeed a natural Brazil. Nice friendly chaps those Crankhouse lot, selling seasonal coffee at very reasonable prices, one to keep your eye on, I suspect. 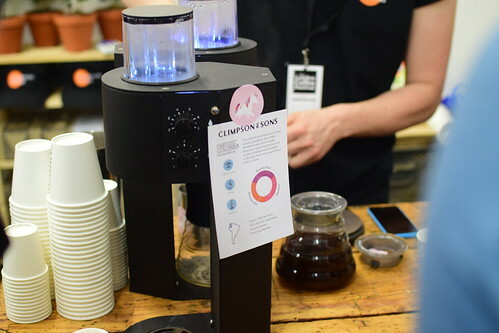 This entry was posted in coffee, Coffee Roasting, Coffee Tasting, Espresso, London, London Coffee Festival, Uncategorized and tagged Cerro Azul, Climpson and Sons, Crankhouse Coffee, Fetco, Geisha, Granja la Esperanza, Green Cup, London Coffee Festival, Ozone Coffee Roasters, Round Hill Roastery by commoditiesconnoisseur. Bookmark the permalink.